BY THIS EMINENT MAKER. CIRCA 1695. For an overview, please click on one of the images above and scroll through the gallery. For images that you can enlarge to examine in greater detail, please scroll down to the end of this page. 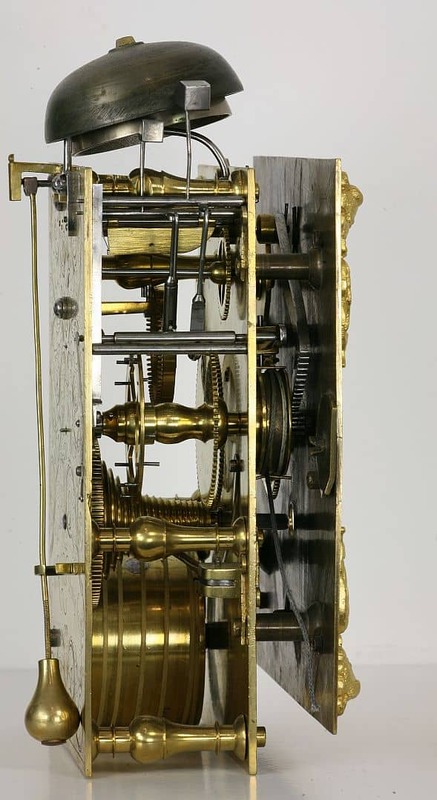 An exceptional early bracket clock. The case is made of oak and veneered with ebony. It stands 11 ¾” high and is of typical Knibb form. 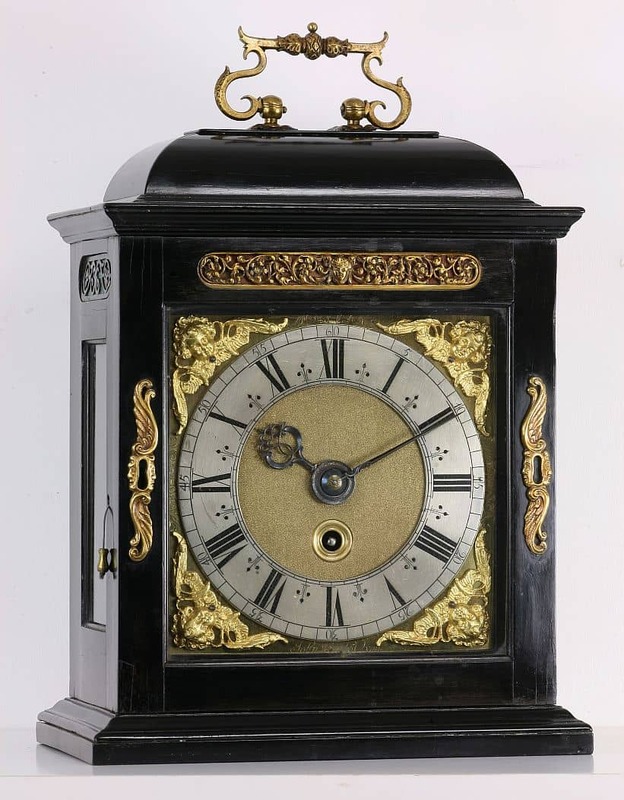 It has a double ‘S’ gilt handle to the top and an attractive gilt brass sound fret of cherub and foliate design. It has elongated scroll escutcheons to both sides of the door, but fully fixed rather than moveable from the top fixing. 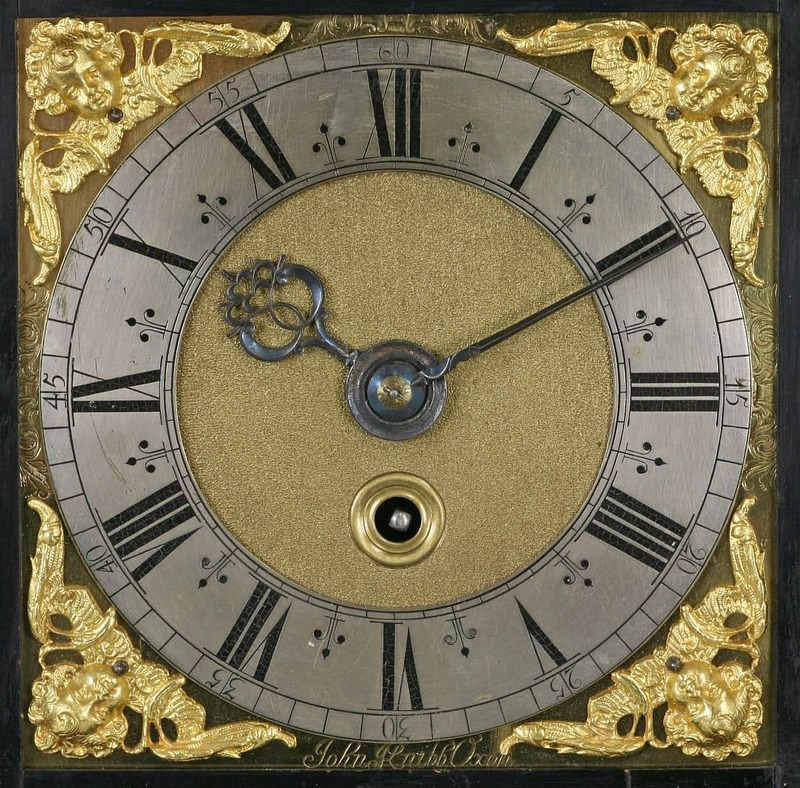 The 6″ square brass dial has wing and cherub spandrels and is signed at the bass below the chapter ring ‘John Knibb, Oxon’. The silvered chapter ring has Roman numerals and Arabic minute numerals with delicate half hour divisions. The blued steel hands are beautifully fretted and chamfered. The winding hole in the well matted centre is ringed. The eight day five pillar movement is fully latched. The pillars are ringed and of an attractive shape. 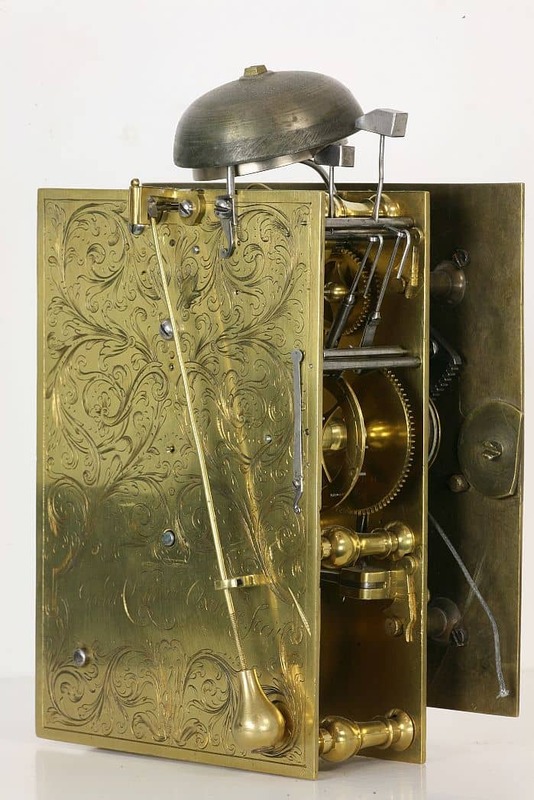 It has a verge escapement with a pear shaped pendulum. It has pull quarter repeat sounding the hours and quarters on two separate bells. Interestingly, the repeat cord could be run to either side of the clock and indeed there is a hole on the opposite side of the case from where it is at present mounted. The backplate is beautifully engraved with foliate scrolls and is signed ‘John Knibb, Oxonia, Fecit’. There is a pendulum hold fast for the bob pendulum. 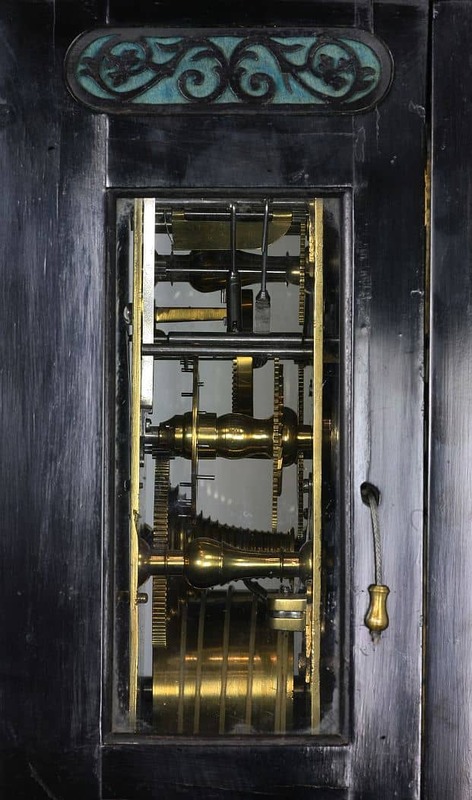 The movement is secured into the case via two round turn buckles or latches on the back of the dial. Small bracket clocks by either of the Knibb brothers are rare and much sort after. John Knibb was the younger brother of Joseph to whom he was apprenticed in 1664. He was born in 1650. He was made Free of the Clockmakers’ Company in 1673. The early part of Joseph and John’s career was spent in Oxford where Joseph had set up business in 1662. However, when Joseph moved to London in about 1670, his brother John stayed behind in Oxford to run the Oxford side of the business. He was made a Freeman of the City of Oxford in 1673. He became Mayor of Oxford in 1700. 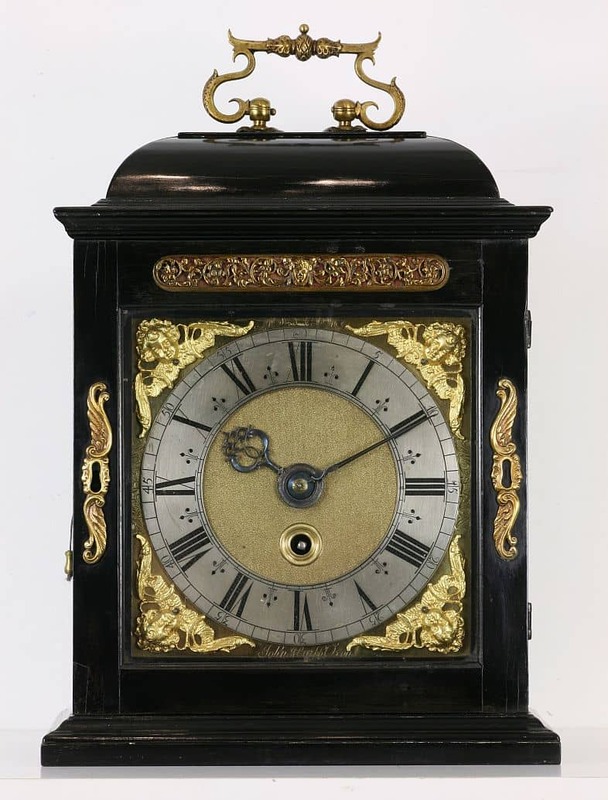 He had a large and varied client base in Oxford and his best clocks were the equal of those made by his brother in London. He had a number of apprentices, the earliest being Samuel Aldworth in 1673, the year he was Freed. He inherited Joseph’s estate on his death in 1712. John died at Oxford in 1722. 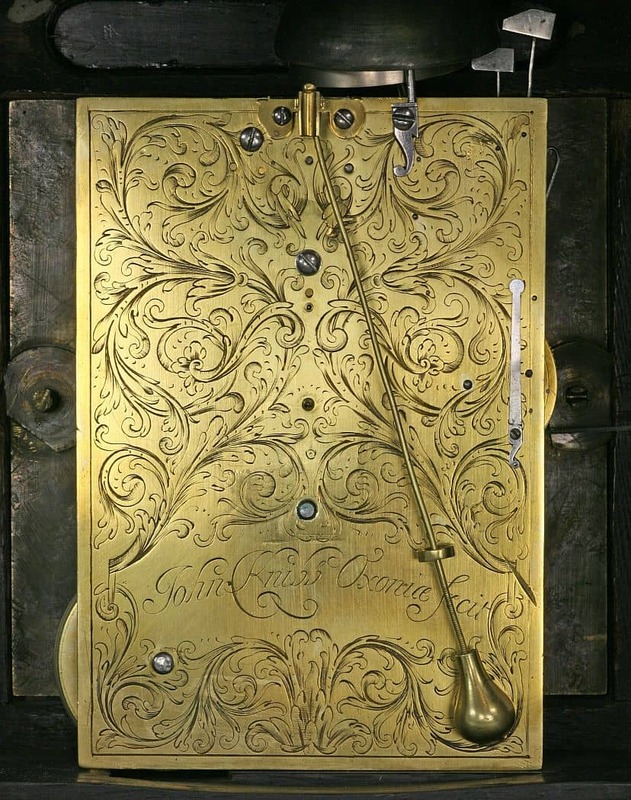 For further reading see ‘The Knibb Family of Clockmakers’ by Ronald Lee. Click on the images below to view at 100% in a new browser window. To zoom in even further, press ‘cmd’ or ‘Ctrl’ & the ‘+’ key. Or simply expand on your touch screen phone or tablet. NB: to revert to your normal screen size after viewing press ‘cmd’ or ‘Ctrl’ & the ‘-‘ key.